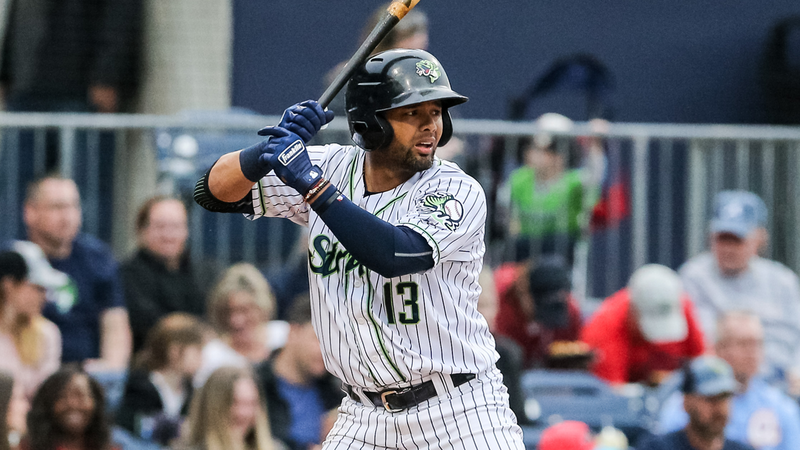 LAWRENCEVILLE, Ga. - Gwinnett Stripers infielder Andres Blanco has been named the International League Player of the Week for April 8-14, the league announced Monday. Blanco, who turned 35 on April 11, batted .476 (10-for-21) with two doubles, three home runs, six runs scored, 10 RBIs, and one stolen base in five games during the week. His hot stretch came after he opened the season 0-for-9 in his first three games in a Stripers uniform. The Urama, Venezuela native is batting .333 (10-for-30) with two doubles, three home runs, six runs scored, 10 RBIs, and one stolen base in eight games with Gwinnett this season. He currently ranks in the IL top 10 in RBI (T-6th), OPS (8th, 1.144), home runs (T-8th), and slugging percentage (10th, .700). Originally signed by Kansas City as a non-drafted free agent in 2000, Blanco has combined to bat .256 with 18 home runs and 109 RBIs in 536 Major League games with the Royals (2004-06), Chicago Cubs (2009), Texas Rangers (2010-11), and Philadelphia Phillies (2014-17). He has also logged 876 minor league games, batting .255 with 35 homers, 292 RBIs, and 77 stolen bases. The Atlanta Braves signed him as a minor league free agent on December 5, 2018. Blanco is the 17th player in Gwinnett club history to win the IL Player of the Week award, and the first since Danny Santana on May 28, 2018. It is Blanco's first career Player of the Week award at any level of baseball. Blanco is one of two Gwinnett players to win an IL weekly award this season. Mike Soroka was named IL Pitcher of the Week for April 4-7.